Today for a spell, as indicated in the red ellipse on this screenshot, the Dow Jones Industrial Average was unavailable on the Wall Street Journal website subscriber edition’s home page. As if that weren’t outrageous enough, the index was just as AWOL from any of the immediately accessible pages under the “Markets” tab, on this screenshot circled in blue. Um, the website for the premier publication of Dow Jones & Company makes its subscribers wander off to some other non-Dow website to get an update on its most famous equity index?!? Then again, why is that not really all that unexpected? 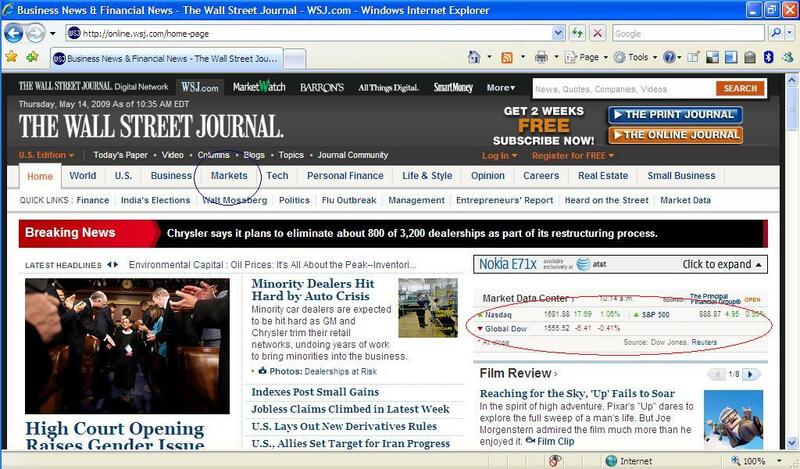 Sooner or later, everything the WSJ touches – even its own most treasured index – suffers from the WSJ syndrome.